We were approached to create a bespoke access stairway up to a loft conversion. The customer wanted something space saving, stylish and modern. 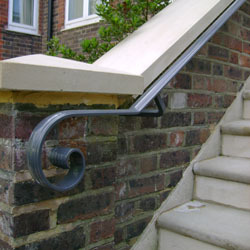 This customer wanted an elegant and modest hand rail to compliment their grand entrance to their house. We produced a bespoke enclosure and access gate for this basement entrance that complimented this victorian style building. The owners of this modernised apartment wanted a fashionable and chic stainless steel railing to enclose their balcony. We were employed to add a tasteful finishing touch to this newly built house. We are a creative and professional metalwork business with the purpose of fabricating and manufacturing as well as installing gates, railings and balustrades for businesses and the general public. We also produce a wide range of contemporary work including roof terraces, garden furniture, outdoor features and other unique bespoke work on request. Our clients include O², Headmasters, Mercedes Benz and the Royal Horticultural Society. We are able to provide the following services with over ten year's experience.